This cheesy, sweet and savory fall dish contains a delicious variety of flavors and textures. Kabocha is lower in FODMAPs than the more familiar butternut squash; it has a more complex taste and a sweet-potato-like texture. Grocery stores often sell kabocha mislabeled as buttercup squash, so consult some photo references before you shop for this nutrient-packed autumn meal. Preheat the oven to 400F. Oil a baking sheet or line it with foil for easy cleanup. Pierce the squash several times with a fork and place it on a microwave-safe plate. Cook on high power in the microwave until it is soft enough to insert a knife easily, 8 to 12 minutes. While squash is cooking in the microwave, measure quinoa, water, salt, thyme, and sage into a 2-quart saucepan. Cover and bring to a boil; reduce heat to maintain a simmer and cook for 7 minutes. Add chicken, stir, re-cover, and cook until water is absorbed and the white tail of the quinoa seeds can be seen, about 5 to 6 more minutes. Remove saucepan from the heat and allow it to sit, covered, for 5 more minutes to complete the cooking process. Fluff the quinoa and chicken mixture with a fork, and stir in the cranberries, scallions, and blue cheese. When the squash is cool enough to handle, break or cut the stem off, and cut the squash in half horizontally. Scoop out and discard the seeds. Place the squash halves, cut side up, on the prepared baking sheet. Brush the inside and rim of each half with 1 tablespoon of maple syrup. 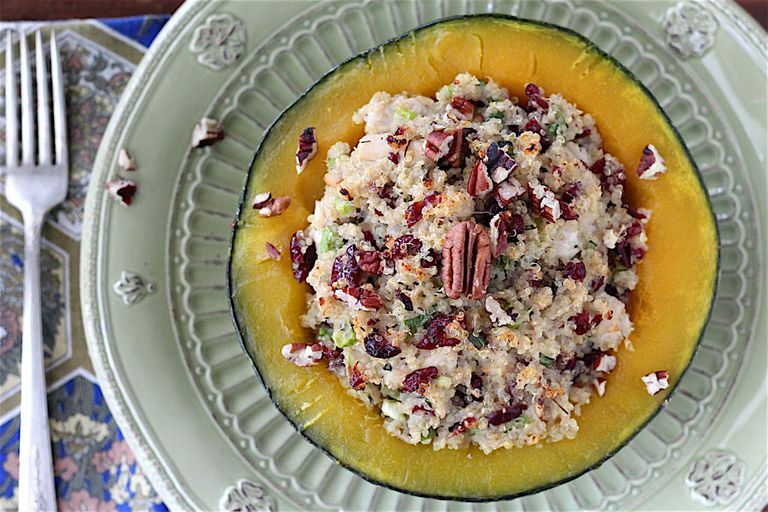 Fill each half with a mound of the quinoa and chicken stuffing. Bake in the center of the oven until the quinoa mixture begins to turn golden brown, 15 to 20 minutes. To serve, cut each squash half in two for a total of 4 servings. Sprinkle each quarter with a tablespoon of chopped pecans. Use crumbled raw ground chicken instead of the diced chicken if you'd like. To make this recipe vegetarian, omit the chicken or substitute 8 ounces of crumbled tempeh for the chicken. If you prefer milder cheeses, substitute shredded cheddar or aged Gouda for the blue cheese. Light eaters may find that one-eighth of the stuffed squash is a large enough portion. Purchase toasted pecans or toast your own in a heavy skillet over medium heat, stirring constantly, until they darken a shade and become fragrant, about 5 minutes. The kabocha will not cook much further in the oven during the short baking time, so make sure it is cooked to your preferred level of tenderness during the microwave step.